Author jonPosted on April 1, 2019 April 1, 2019 Categories Miscellany 2019, TransportTags railways, trains, transport, transportationLeave a comment on Is Every Railway Project Is The Same? I made a simple resolution as we went into 2017: I would drink an extra small bottle of water everyday to improve my hydration. So far, that one is working. Back in December I also decided that, on the last Sunday of every month, I would write something for this site. It wasn’t really a resolution, rather an updated version of the Blog Every Wednesday in August task I set myself a few years ago: the idea was to write something here to make paying for the hosting worth it. This new commitment was given the title “Sermon Of the Last Sunday”. As with all things these days, there’s a hashtag #SOLS. See if you can work out which came first: the series name or the hashtag. Also at the end of last year I set myself a Goodreads challenge to read 12 books in 2017. This shouldn’t be the hardest commitment as it’s just one book a month but, if I succeed, I will end up reading more than I did last year. There are plenty of people that inspired me to try this challenge (which you can follow on Goodreads) but, possibly, I made my decision after reading Bill Gates’ favourite books of 2016. He manages an eclectic list of recommendations. I hope to have as diverse a range of books on my ‘has read’ list by the end of the year. So, when trying to come-up with the first SOLS entry I thought I’d review one of the books that ended last year. It was the book I was reading when I read Bill’s list; it was fascinating and a little hard-going at times but it took me out of my daily commute and made me think about something else. Which, I think, is something a good book should do. I have reviewed books here before, and I am not sure I will attempt to review all 12, but it’s such a well written book I’d recommend adding it to your own reading list. I’m grateful to the staff of Waterstones in Chichester who persuaded me that this was a book worth reading as I was browsing their store at some point last year. I don’t often spend time just wandering book shops but there was an opportunity and I took it. I’m very glad I did. For some people, a job takes you to the same place each day, surrounded by colleagues who you see daily and get to know over time. Not quite so for pilots, especially those flying long haul, where the variation in crew is almost as changeable as the constantly altering view from the cockpit. Mark Vanhoenacker, a British Airways 747 long haul pilot, writes about flight through series of chapters documenting the experiences of moving from one part of the world to another with chapters such as Place, Wayfinding, Night and Return. It’s not a biography of a pilot, a technical guide to flying nor a travelogue rather it’s a rhapsodic love affair with flight and all it involves and, so, it’s a little bit of all those things put together with some beautifully written, almost lyrical, prose. Don’t expect a chronological guide to flight but a collection of chapters that take their subject and describe the experience from the complex to the minutia; written from a vantage of someone obviously captivated by the charm of flight. The style is vivid and descriptive, but the detail of the language can sometimes make reading it hard work. Don’t let that put you off because it’s worth a little perseverance to get close to understanding why the experience of flight it both magical and disorienting at the same time. 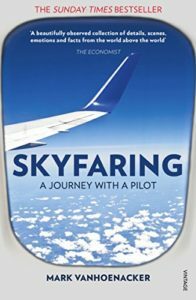 Skyfaing, A Journey with a Pilot, available at Amazon. Early in the second world war, London had been bombed by the German Luftwaffe – a period known as The Blitz. In spite of early attempts by the government to lock them, Londoners took shelter in many of the city’s Underground stations. In addition, parts of the Underground were used to store national treasures. Today it’s on an unused branch line, but in the 1940s Aldwych tube station, that I visited once before, protected artefacts from the British Museum from the damage aerial bombing could inflict. At the height of the bombing, there were demands from the public for the government to provide more shelters. The government turned to the London transport authorities – who had the technical experience building below ground – to build new shelters. And, even though the bombing raids over London had subsided, a total of 8 deep-level shelters we’re built (although 10 had been commissioned). All the new deep shelters were built near existing tube stations: the unrealised dream being to bring them into service as railways post-war. The shelters were eventually used for their intended purpose in the latter years of the war when, in June 1944, the flying bombs were sent to attack the city. 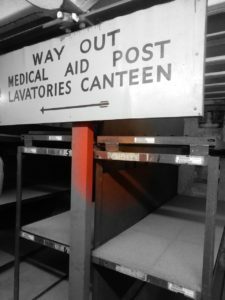 Last Sunday, as part of London Transport Museum’s Hidden London series,2 I visited the deep-level shelter at Clapham South. The above-ground pillar box can still be seen just around the corner from the existing tube entrance. 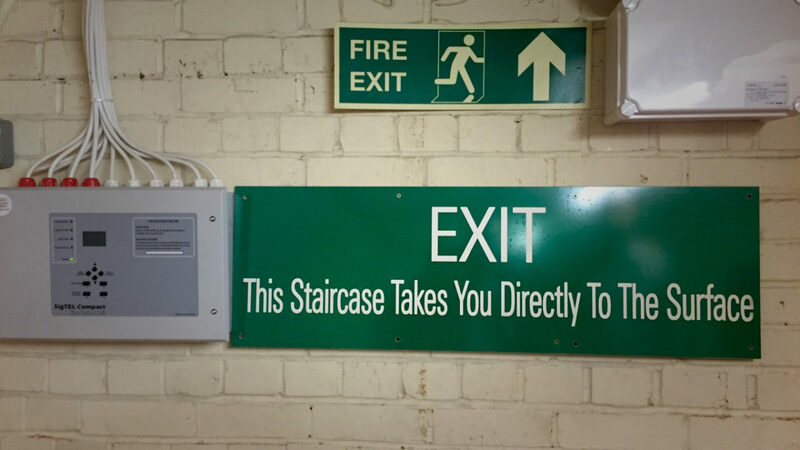 The shelter is connected to the station but the walls have long-since been sealed forcing visitors to descend (and return later) via a 180-step spiral staircase. The lift, it appears, either not in working order or no longer fit for public use. It’s not easy on the knees but, somehow, not quite as many steps as it sounds. Below ground is a fascinating place. Wartime pictures of the shelter show the kind of Blitz-spirited Londoners that only seem to appear on old newsreel films.3 In reality, the space built for almost 8,000 people, must have been cramped, crowded, smelly and – probably – very loud. Even with the welcome addition of the canteen-served jam tarts that were not subject to the ration book, I can’t imagine it was the nicest of places. Admittedly, the feeling of 120 feet of earth above you probably went a long way to making it a sanctuary from the horrors above the ground. 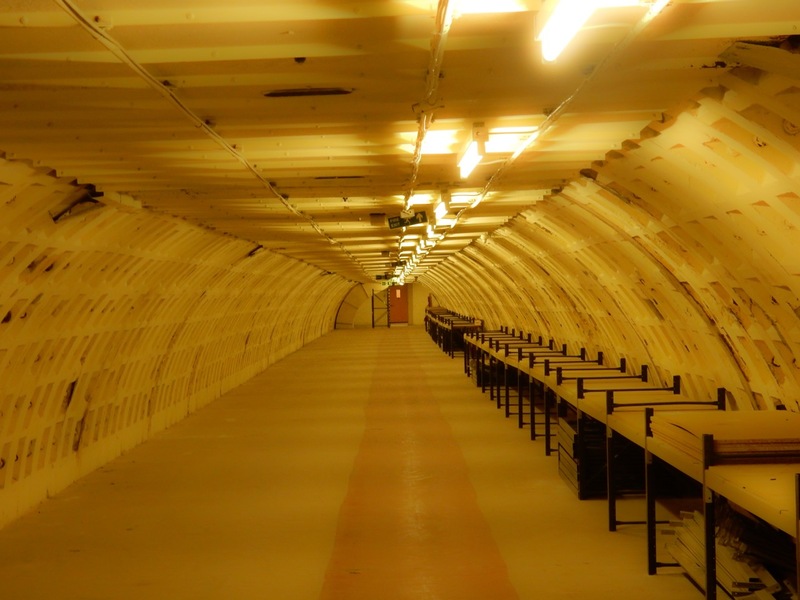 The tunnels through which you are escorted on the tour are astonishingly clean & tidy – having been most recently used as a secure archive storage facility – but it’s clear from the remaining bunk beds that life would have been cramped. Row, upon row, of the stacked bunk beds could have given almost 8,000 people safety in the Clapham South shelter; your particular bunk marked on the ticket required to access the shelter. Most people would have to bring their belongings down in to the shelter each time they went; exceptions were made for people whose houses had been destroyed by the war. That’s 180 steps with mattresses and other personal items that you wanted to keep with you. Walking across the Thames bridges in the August sunshine is a world away from the realities of wartime in the city: the Hidden London deep-level shelter tour a small, but important, reminder of what people went through and a fascinating insight into the ingenuity of the city to protect citizens in more difficult times. If you’re interested in the Hidden London series of tours, visit the London Transport Museum site to see when the next series is scheduled. BEWA (Blog Every Wednesday in August) is a project aimed to get me writing in a blog style again. I wrote an introduction to kick the series off while the first proper entry championed an Olympic legacy. The third discussed my fascination with location data while what should have been the fourth entry was more of an Oops. There is a page with the #bewa collection (including those from last year). Fingers crossed I am back next week. I’m sure @curns will mention it. Jakob Nielsen reports that researchers from the University of York have performed a study to assess why it’s so annoying when other people have cellphone conversations in public. The whole saga of the upgrading of the west coast main line is outlined in today’s Guardian. One of the most disturbing facets of the west coast saga is the failure of democratic government that it represents. Not just of a particular party, but the whole system of government. And yet we cannot accuse our elected representatives of looking the other way. In mid-February and early March of 1995, after the consultants had delivered their report but while Railtrack and the government were still mulling over it, members of the House of Commons transport committee questioned Edmonds, Horton and the heads of some of the big signalling firms about the WCML project … Members of parliament had done what they were elected to do, conscientiously and thoroughly scrutinising a big plan by an unelected organisation with power over the lives and purses of the public. It had pointed out its weaknesses. And nobody paid any attention. What the article does highlight is that, today, projects of national importance and public good like this one come second to short-term profit, power and – to some extent – ego. I wonder if we will ever see a situation where transport planning is for all our good rather than the few? I haven’t spoken of London’s traffic problems for a while now. This is because it’s a bad story and I am trying to be positive. I have not been overly delayed for sometime (although every taxi I take tries to navigate Trafalgar Square which is a automobile no-go zone at the moment). I also realise that London is a big city which is home to many millions of people who all travel. It stands to reason then that, if the system should fail one day, movement will be difficult. I know that an integrated public transport system run (efficiently, effectively) for the people is a (very) long way off. If we’re not careful, the UK will topple over as the South East of Britain sinks into The Channel under the weight of all the people migrating from other parts of the country. 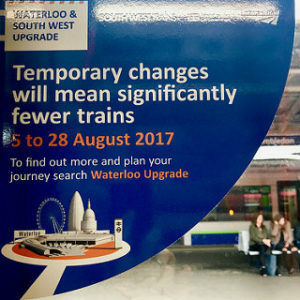 After last night’s little rant on the state of the London Underground system, I heard about this morning’s nonsense from the Strategic Rail Authority (SRA) to start charging commuters more to sit on over-crowded, dirty, late-running trains. I guess the plan reasons that charging higher fares means fewer people will travel by train. Surely, this proves that an integrated transport policy for London’s workers remains a non-existent dream. Ken Livingston wants to charge people for driving into central London. 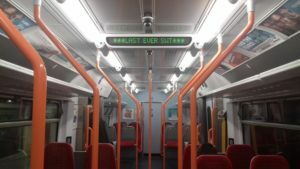 The SRA wants to charge more for travelling on trains. How are people expected to get into work? The answer is they will still drive and take the train and it will cost them more – status quo remains. It seems to me that nobody is prepared to do what it takes to sort transport in the South East out. And that still stinks. So then, I got to thinking about John Prescott’s [John Prescott as Boss of Bosses?] little plan to build more affordable housing in the South East of England (to ease the cronic housing shortage, apparently). Affordable housing implies that this is aimed at people on a lower wage (am I taking a big leap here?). How, exactly, are these people going to get to work in London if train prices rise and roads get tolls? Again, it appears inconsitnet and badly thought out. Why not take some of these £4 billion and encourage businesses to move out of the South East to areas where there are too many houses or where there is less congestion. If we’re not careful, the UK will topple over as the South East of Britain sinks into The Channel under the weight of all the people migrating from other parts of the country. It’s a rant about the tube. 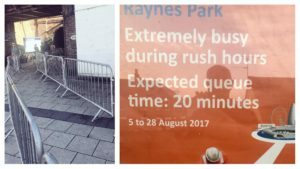 Summer brings its own special brand of problems for London’s sub-terrain commuters: hot, sweaty and stuck in tunnels on the way to the office does not make for a contented work force.